An ATARI Computer may soon be sailing the high seas aboard an oceangoing vessel piloted by Tay Vaughan and students from the Bay Area Marine Institute. 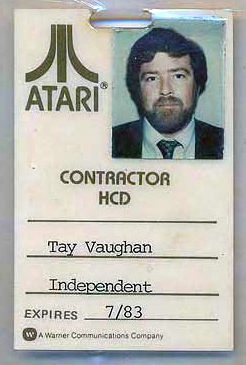 Tay Vaughan, founder and President of the Bay Area Marine Institute at Pier 66 in San Francisco, looks forward to the ATARI Computer's maiden voyage. The idea of a personal computer aboard a small ocean-going craft has burned within his imagination for well over a year now. 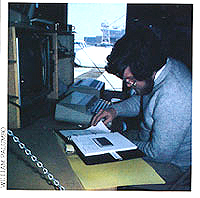 The Institute already uses an ATARI 800 Computer as a teacher of piloting skills, a boatyard maintenance manager and as an assistant for naval architecture design. The next phase is to develop applications for sea-going craft. "When out to sea, your vessel is much like a spacecraft. You're responsible for every aspect of your existence," says Tay, explaining the Institute's Marine Services Training Program. "You need a multitude of skills to maintain your life support system. Our training program is designed to teach these skills. Marine Services Technicians are versed in woodworking, carpentry, fiberglass, coatings, finishes, electrical systems, plumbing and engine mechanics. When they graduate, they will be identified as Renaissance Men of the Sea." Tay defines a renaissance person as, "Someone who can draw upon a great variety of skills and apply them with competence and imagination." The definition is personal and applies to Tay Vaughan himself. The son of a Boston physician, Warren Taylor Vaughan III sailed aboard a Norwegian freighter as an ordinary seaman at the age of 19. He spent a year as an exchange student at the University of Vienna, then returned to the United States to earn a B.A. degree in anthropology and sociology at Oberlin College. A child of the sixties, a man of the seventies, he dropped out of the Ph.D. program in medical sociology at U.C. Medical Center, San Francisco -- the idea of building an ocean-going sailboat seemed more compelling. The boat was built and named "The Great Bear." 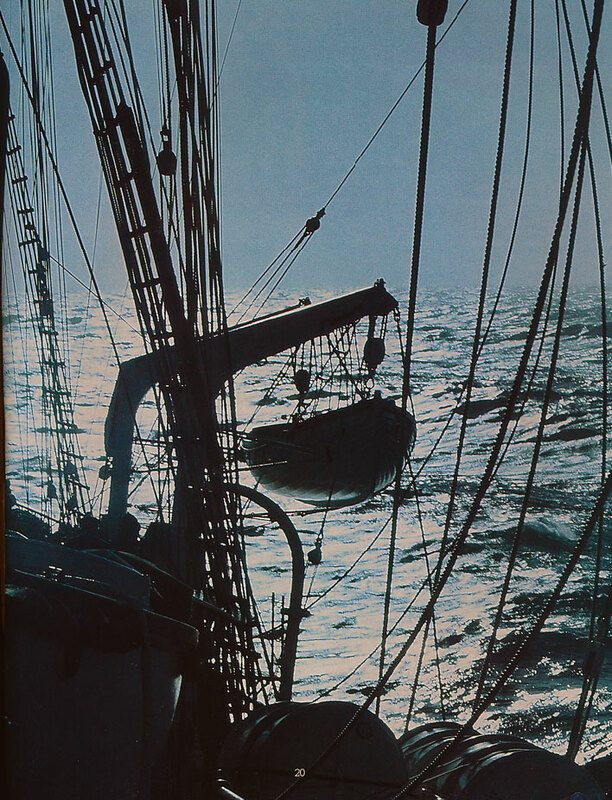 The Bear and Tay plied the seas for 17,000 miles --the odyssey ended with Tay signing on as Chief Master Carpenter to rebuild the racing yacht, Intrepid, for the 1974 America's Cup races. Intrepid lost to Courageous that year. "I had nothing to do with the race," claims Tay. "Leonardo DaVinci was the original renaissance man," concluded Tay. "On one hand he was an artist. On the other, an early developer of aerodynamic principle." Would DaVinci have used a computer? "He would have painted a fourth Mona Lisa for an ATARI Computer." Tay Vaughan and the Bay Area Marine Institute have developed and written several major computer programs designed for the small craft boating industry. The Boatyard Management System provides an inexpensive computerized management tool for boatyard operators, dealers, and marine repair shops. The system keeps track of work orders, employee man-hours and costs for each repair or maintenance job. McFOP (Microcomputer Floating Object Program) is a naval architecture design tool developed by C. B. Shaver, a naval architect associated with the Institute. The McFOP program calculates hydrostatic properties of ships, boats, barges, docks, etc. Ships in the Night is an ATARI Computer player/missile graphic display of ship navigation light patterns as seen on the sea at night. Students can be taught to determine a ship's direction by the patterns its navigation lights form according to its heading. Tay has some interesting ideas and future plans for integrating the ATARI Computer with the Institute's sea-going projects. 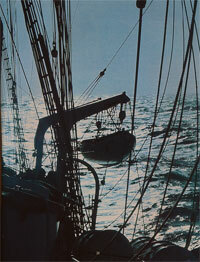 "One of our people, a well known naval architect, has experience with fishing vessels. For example, we would like to develop a computerized information model for the longline fishing industry. We'd like to take the ATARI Computer to sea and feed it information such as wave and wind conditions, size of catch, fuel consumption rates and hull speeds. Then we would create a complete information picture -- maybe adding the prices of fish in Monterey compared to Bodega Bay. You could then ask the computer-Where should I sell my fish for the best price and the least cost to me?" Beneath the salty exterior there exists a lucid, creative individual who mastered BASIC computer programming within a few weeks. The programs written thus far by The Bay Area Marine Institute reflect a synthesis of imagination and plain hard work. How does one find the motivation to learn BASIC computer programming? Is writing computer programs a tedious and difficult endeavor? "If you can learn to order dinner in French or Spanish you can learn to program," says Tay. "Computer programming is an artistic expression. It used to be I'd go out evenings to the woodworking shop and put together a cabinet or a little jewelry box. Since we got the ATARI Computer I've been spending that same creative energy fooling around -- seeing what I can make the computer do. When you have your own personal computer and you need something done, you simply write a program. Then the computer works for you, doing exactly what you have told it. It's a satisfying experience." The Bay Area Marine Institute is offering their computer programs to the small craft boating industry. Anyone who purchases these programs becomes a member of a users' group. The Institute also publishes a quarterly newsletter, Floating Point, which features articles, computer programs and news about computers being used for marine services applications. "Our experience with the ATARI Computer has been a revelation. It is extremely easy to use -- we've discovered we have a tremendous amount of power. 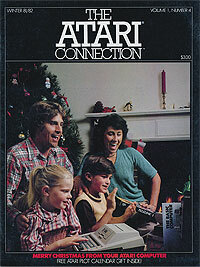 We treat the ATARI Computer like an appliance or shop tool. It came in a box -- we easily hooked up the disk drive, an interface module, and a printer, and it worked. We've had no mechanical problems with one exception which was our own fault. One of our apprentices was playing Star Raiders and got so excited he fell off his chair onto the ATARI 825 Printer. It dropped to the floor, spilling ribbon and parts all over the place. We took it to the ATARI Computer Service Center just like you would take your toaster or blender to an appliance center. They had it fixed in about ten minutes and gave it back to us. It doesn't require a fancy maintenance contract or a software support system. It's a tool like the tools we have in our boat repair shop." ...Tay Vaughan, The Bay Area Marine Institute.